The zoning allows for a wider array of uses and encourages denser development. 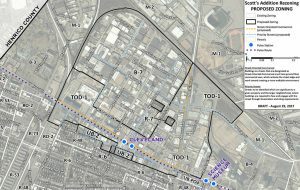 A months-long effort to revise city zoning to allow for more density in and around Scott’s Addition has received final approval from Richmond City Council. At its regular meeting Monday, the council approved amendments to city code that change Scott’s Addition’s zoning primarily from M-1 light industrial use to B-7 mixed-use business district, allowing for a wider array of uses and encouraging denser development in the fast-transitioning neighborhood. 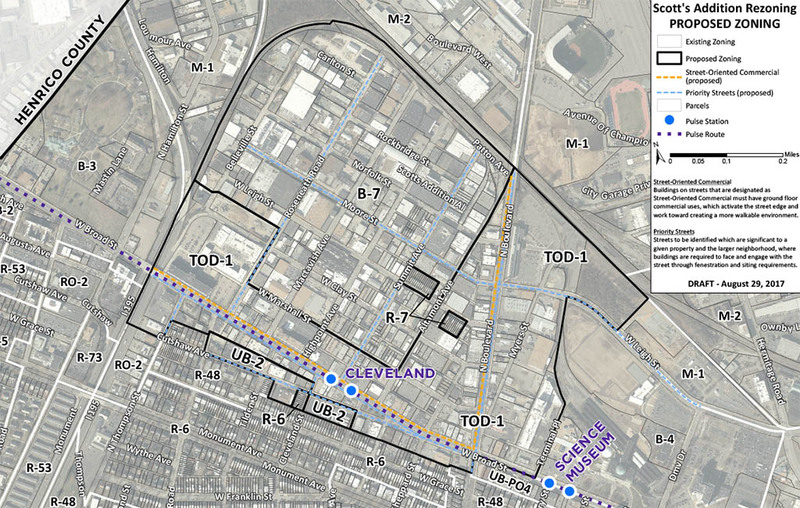 The changes also create a new zoning district – TOD-1, or “transit-oriented nodal district” – that will allow for taller, “mid-rise” development along the Boulevard, Myers Street and West Broad Street corridors that border Scott’s Addition to the east and south. Described as “unabashedly urban” in character, the new zoning district – a version of which was first proposed late last year – allows buildings up to 12 stories and reduces parking requirements, with the goal of restricting surface parking lots and allowing parking facilities to be market-driven. That’s good news for David Morrison, one of the business owners developing the Highpoint Collective artist and small business space in the former Sea Dream Leather building at 3300 W. Broad St. – the building with the “Feel the Bern” Bernie Sanders mural. A map of where the new zoning districts apply. Prior to the change, Morrison said, he would have needed to secure six more parking spaces, in addition to available on-site and on-street parking, to comply with city requirements. With the new zoning, he said, he no longer needs to provide those spaces to go forward with the project, which is aiming for an October or November completion. “The city’s been very willing to work with us, and we’ll be able to solve the problem we’ve had,” Morrison said. New surface parking is not permitted as a principle or conditional use under the new zoning, which instead encourages developers to provide parking according to market demand through screened parking decks and off-premise and on-street parking. The changes are prompted by the city’s forthcoming rapid transit bus line, GRTC Pulse, that will run primarily along Broad Street from Willow Lawn to Rocketts Landing. 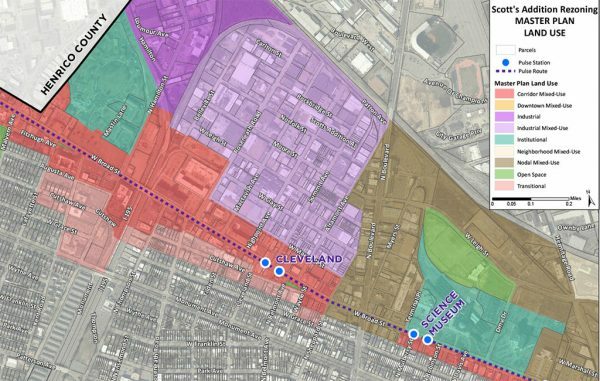 The amendments aim to achieve the land-use goals set forth in the city’s Pulse Corridor Plan, which was adopted earlier this year. Construction for the bus line continues along Broad Street, with the goal of running buses by June 30, 2018, the project’s contractual completion date. Meanwhile, new construction and redevelopment continues in the area. Along Myers Street, across the Boulevard from Scott’s Addition, steel framework for the River City Roll bowling alley is going vertical, next door to a planned AAA service center that has demolished part of the former Woody’s Auto Service building. 6 Comments on "New zoning in place for Scott’s Addition, Boulevard"
Scott’s Addition is already the Uber Drop Off capital of Richmond, and if Pulse works it will be an area that people can live in with no car. The Pulse delays will free up a lot of bonus money promised to the contractors if they’d accelerated their work. That money should go to the merchants along Broad that have been crippled by the construction and loss of on street parking. The contractors claim that he City is to blame for its slow payment process, causing them to lose skilled labor, as well as delays from the discovery of buried but unchartered utility lines. Let’s not forget that the new RVA Bike Share as well as privately owned bicycles will also be an important part of the transportation mix in Scott’s Addition and elsewhere in the city. You can fit 10 bicycles in the space needed for one car.